Situated in two areas of the cytoplasm. They are seen scattered in the cytoplasm and a few are connected to the endoplasmic reticulum. Whenever joined to the ER they are called the rough endoplasmic reticulum. The free and the bound ribosomes are very much alike in structure and are associated with protein synthesis. Around 37 to 62% of RNA is comprised of RNA and the rest is proteins. Prokaryotes have 70S ribosomes respectively subunits comprising the little subunit of 30S and the bigger subunit of 50S. Eukaryotes have 80S ribosomes respectively comprising of little (40S) and substantial (60S) subunits. The ribosomes seen in the chloroplasts of mitochondria of eukaryotes are comprised of big and little subunits composed of proteins inside a 70S particle. 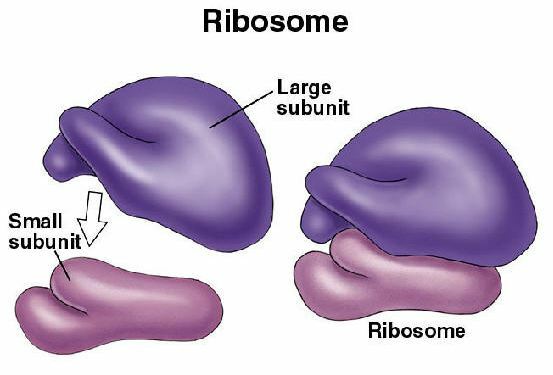 Share a center structure which is very much alike to all ribosomes in spite of changes in its size. The RNA is arranged in different tertiary structures. The RNA in the bigger ribosomes is into numerous continuous infusions as they create loops out of the center of the structure without disturbing or altering it. The contrast between those of eukaryotic and bacteria are utilized to make antibiotics that can crush bacterial disease without damaging human cells. The process of production of proteins, the deoxyribonucleic acid produces mRNA by the process of DNA transcription. The genetic message from the mRNA is translated into proteins during DNA translation. The sequences of protein assembly during protein synthesis are specified in the mRNA. The mRNA is synthesized in the nucleus and is transported to the cytoplasm for further process of protein synthesis. In the cytoplasm, the two subunits of ribosomes are bound around the polymers of mRNA; proteins are then synthesized with the help of transfer RNA.